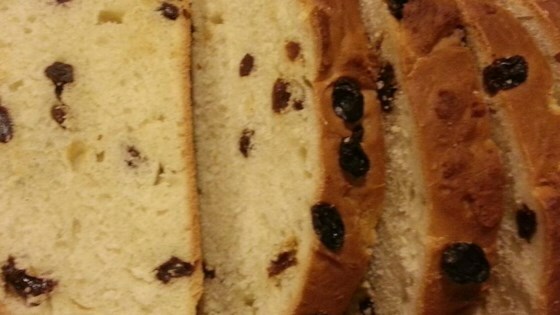 "This traditional Italian Christmas bread is suited for dessert, afternoon tea or breakfast. Enjoy!" Form dough into a ball, place in prepared cake pan, cover loosely with dish towel, and let rise 30 minutes. (Loaf will rise above the pan sides.) Brush with melted butter, if desired. Bake for 45 minutes, or until loaf is golden brown and a toothpick inserted in the center comes out clean. Makes 10 wedges. Took TOO long to make. Really not much flavor. This Panettone turned out wonderfully! Thank you so much for the clear and cincise directions! !